The weekly interactive music program for infants and toddlers will soon start a summer session, and you can try an introductory class for free. My almost-two-year-old usually clings to mama in unfamiliar situations (as he should). So when we arrive at a Rock-a-Baby music class in Barrington, I am not surprised when he sticks to my lap during introductions. It's his first time at the class, and many of the children have already been enrolled for a few weeks. Infants and one-, two- and three-year-olds joyfully run (or crawl) around the room, chasing each other while laughing and shrieking in happiness. As the music begins, my son sits with wide eyes and a shy smile on my lap, grasping my knees and taking it all in. Once tambourines are handed to each child, his hesitation is gone, and he is up and off, shaking the instrument to tunes and sharing with other children. Rock-a-Baby is a weekly interactive music program for infants and toddlers. Six- to twelve-week sessions include classes that are forty-five minutes long. But they get a lot of entertainment in for those forty-five minutes! A trio of humans team up with their puppet friends Rhythm, Melody and Harmony to teach children songs and encourage hand and body movement through rhythmic repetition. 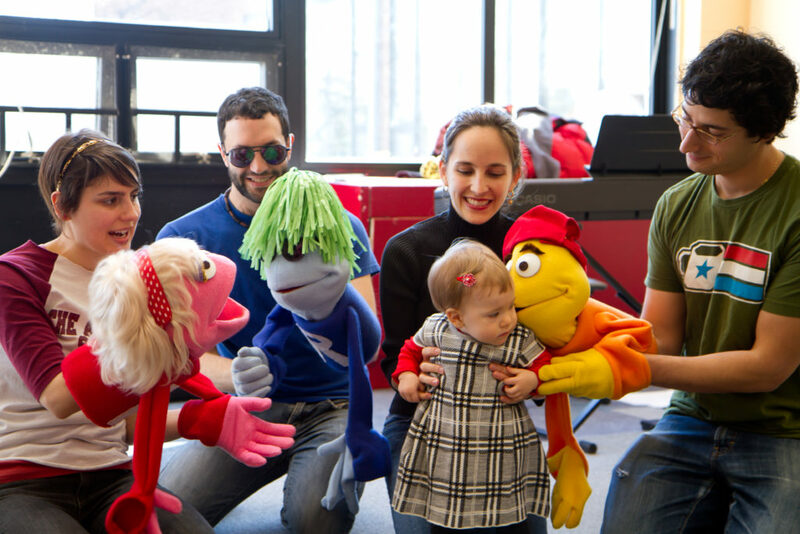 The curriculum was developed by New York University trained music educator, Marc Trachtenberg, who plays the keyboard while Becca Christie sings songs with the help of the smiley pink puppet named Melody. Benny Tilchin plays the guitar and sings, and gets Rhythm acquainted with the kids. The music is live combined with recorded tracks and songs can include everything from rock to Beethoven. Trachtenberg, Christie and Tilchin all have extensive backgrounds in music. Trachtenberg, who has two boys ages six and four, started out as a piano teacher by day and keyboardist by night. After NYU, he became music director for plays and music programs at schools and community centers in Rhode Island and New York, including co-writing children's musicals at the Wheeler School. He has also composed and performed for television and the web. For all of us '90s kids, he was the voice of Keanu Reeves on MTV's "Celebrity Death Match." His wife helped him get Rock-a-Baby classes up and running. Christie is a longtime singer who studied music at the University of Rhode Island, and graduated in 2013. She was a member of a cappella group Lively Experiment, and performed in musicals Cinderella (as Cinderella) and as Maria in The Sound of Music. Tilchin plays double-duty with the rock-a-babies and the cool kids as a member of the band The Mighty Good Boys. Each Rock-a-Baby class has a different theme, and on the morning I attend, the theme is water. Christie and Melody sing songs like Tina Turner’s “Rolling on a River” and “The Swimming Pool Song,” while demonstrating all the different actions that go along with the songs. We move in circles, and pretend we are swimming along a river and diving into a pool. The children play tambourines and they learn to share by passing around a percussion instrument. They also bounce and chase colorful balls around the room, and finish off the morning with story time and popping bubbles. At this point, my son is now across the room from me, involved with the group of other kiddos who are trying to pop bubbles floating up to the ceiling. Meanwhile, I am chatting up the other moms, eager to make new friends, too. Interested in Rock-a-Baby? The summer session starts June 29 for eight weeks for infants and toddlers (ages four months through four years old). You can try a class for free in Providence, Warwick or Barrington before the new session starts. Space is limited. Please contact info@rock-a-baby.net or 401-524-7113 to register. More info at rock-a-baby.net. Marc Trachtenberg, Benny Tilchin and Kate Jones.